7 out of 13 – seriously, I’m still not even sure. The small restaurant inside the Powerhouse is quite a special place. Its setting is charming, the lighting romantic and the service is professional but attentive. Also, there is a loud bar right nearby, the smell of fish frying pervades the place and the prices are on the steep side. 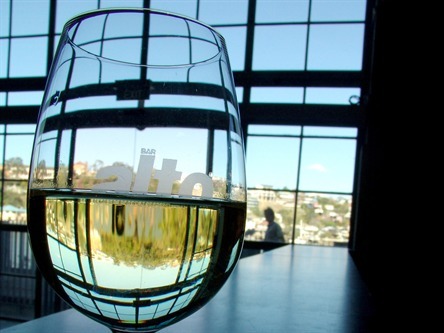 But the truly conflicted thing about my experience of Bar Alto is the thing I ate. I ordered my meal in haste and distraction, and this is what arrived: two delicious slow-cooked smoky pork ribs, sitting on a pile of lentils (?) with three rounds of herbed pork sausage (??) and a few little kipfler potato rounds. To add flavour, the ribs were drizzled with a parsley pesto thing (???) which also flavoured the lentils. While unconventional, it kinda worked. The flavours weren’t amazingly complementary, but they didn’t fight and it was quite interesting as a food experience. Particular moments of joy included trying to pick up one of the ribs- the meat actually fell right off the bone. It was incredibly tender, rich and gave an incredible feeling of winter comfort and decadence. The sausages were also special little circles of wonder – nice and complex in their flavour and a good texture. The lentils and potato and pesto were, well, nourishing and kinda tasty, but I felt a bit baffled by the mix of all of this. Adding to my confusion was the thing The Mistress ordered: it was a bit like a joke with no punchline. Unlike my fairly successful postmodern mashup, here they tried for an Italian classic and failed pretty hard. The dish is Spaghetti Vongole and it’s essentially a delicate clam pasta. This was the blandest I’ve had it, lacking both salt and acidity. Portofino, at the other end of New Farm, does it a lot better. Still not sure what to make of this place, but I’d say the feeling it leaves is generally pretty positive. Next time you’re at the Powerhouse and feeling adventurous, give this a go. This entry was posted on June 29, 2011 by Philistine. It was filed under Uncategorized . Your writing makes me hungry. Fortunately the part about the clam pasta balanced my hunger out. I remember that the Power House made yummy aeoli (spelling?). Sounds like a weird meal.